In the early post-war period, façade panels were attached to loadbearing structures as cladding. Schokbeton was used in Belgium because of the guaranteed durability, high quality finish, and reasonable price. Seghers Prefalith Beton in Aalter started with the production of architectural concrete and became one of the major producers thereof in Belgium. Architectural precast concrete came into vogue in the early 1960s, combining the structural, functional, aesthetic and financial advantages of concrete. CBR-Ergon was established to produce precast concrete and quickly became one of the major players in this field. Eurobeton was established and became an important manufacturer of architectural precast concrete in Belgium. The federation of the precast concrete industry in Belgium was renamed to UACB. The UACB published a first brochure with technical recommendations on decorative concrete in the late 1960s. The UACB formulated technical prescriptions and recommendations for precast concrete. The UACB and the BBRI investigated the durability of existing structures in architectural precast concrete. The catalogue of the UACB listed 31 manufacturers of architectural concrete. Precast concrete was introduced in a wide variety of applications in the facades of house buildings in the post-war period, for example, as small panels attached to loadbearing structural frames, as large loadbearing wall panels, as parapets of balconies, as insulated sandwich panels used in exterior cladding, and as claustra in decorative open screens. The innumerable options in form, composition, and surface finish made precast concrete façade panels very popular. The application thereof was also stimulated by the economic advantage of reduced construction times, and the assurance of higher quality fabrication, because products typically were made off-site in controlled factory environments (as opposed to in situ concrete). From the 1950s onwards, the number of companies producing precast concrete steadily increased, ranging from small family businesses with limited volumes, to large companies with fully equipped research and design teams, which were active on an international scale. Following the post-war development of the building industry in general, the sector was modernized and mechanized – for instance, with the general use of new machinery (vibrating machines and lifting devices), and introduction of new materials. However, the important scientific and technical knowledge, expertise, and technology that precasting companies developed was proprietary, often kept within the firms and their own research laboratories. It was not until the 1970s that technical prescriptions and recommendations were formulated, by the federation of the precast concrete industry, in advance of the first government-issued norm. This norm, NBN B21-601 for precast architectural elements in visible, decorative concrete, was published in 1980. Concrete and reinforced concrete had been used in small, precast elements almost since the invention of modern reinforced concrete in the 19th century, but especially since the beginning of the 20th century. Specific products were developed for the various fields of application: public roads and electrical utility networks adopted concrete pipes, lamp posts, and electricity poles; the residential sector adopted concrete tiles, structural blocks, and elements for floors. Yet during the first half of the 20th century, visible precast elements were rarely used in façades, as the material was considered unworthy and aesthetically inferior. The development of ‘pierre reconstituée’, usually made with small granules of natural stone such as limestone and lime or cement as the binding agent, was an attempt to find an acceptable product midway between precast concrete and natural stone. But the financial and technical advantages of precast concrete elements overcame early reservations, and an increasing number of specialist companies entered this field, offering a growing range of products. In 1936, the Belgian Syndicate for Artificial Stone was established and soon renamed the Syndicate for Building Agglomerates. In 1940, the organization was officially recognized as a trade association. After the Second World War, two important name changes occurred: in 1965 it became the Union for Agglomerates with Cement of Belgium (UACB), and since 1976 it has operated under the name of FeBe or the Federation of the Precast Concrete Industry in Belgium. For house building in the post-war period, three main types of precast concrete elements were used visibly in façades: cladding, architectural precast concrete, and sandwich panels. In the early post-war period, façade panels were attached as cladding to loadbearing structures (e.g. brick walls or concrete masonry). These panels were usually small (e.g. 30 cm by 30 cm, and 5 cm thick). Beginning in 1960, architectural precast concrete came into vogue. This application opened up new architectural possibilities, with varied compositions, textures, and shapes being created. Architectural precast concrete was widely utilized in office buildings, but also in residential constructions, especially high-rise apartment buildings (e.g. for storey-high, loadbearing wall panels or parapets). During the 1970s, insulated concrete sandwich panels came on the market, an indication of the increasing interest in thermal insulation materials. These panels, often one storey high, contained an inner core of polystyrene or another insulation material, and were often used as loadbearing walls in villas or bungalows. In addition to these three main types of precast concrete façade elements, other elements were created for more strictly decorative effects, notably precast concrete claustra and decorative blocks. With respect to claustra, these perforated precast elements in geometric patterns were used to create ‘open-work’ screens, fences, and decorative accents. Decorative blocks were small-sized, similar to façade bricks, and had special surface finishes, e.g. washed, ‘brut’, or cleaved. In the early post-war period, precast concrete panels were used to clad loadbearing walls and skeleton frames. During the 1950s, the field of application grew steadily, as did the options for the panels, with varied surface effects, incorporating different aggregates, coloured cement, and various types of joints and connections. 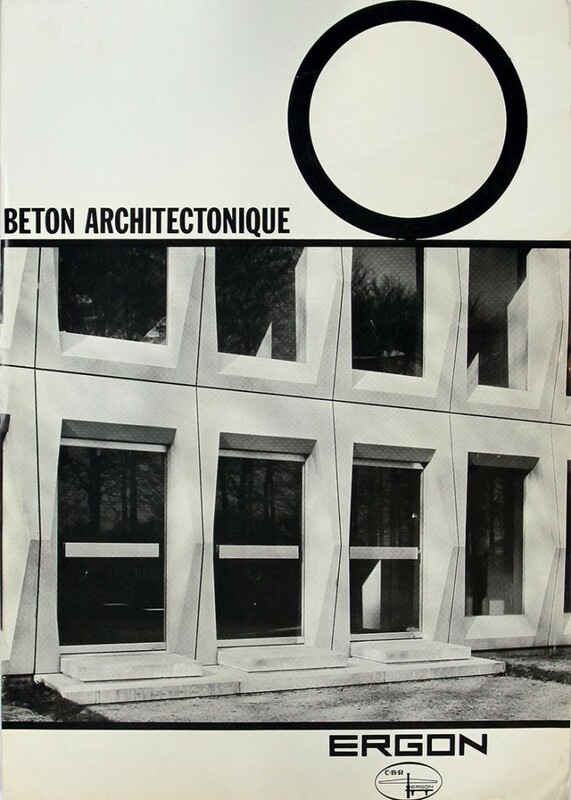 The Belgian Building Research Institute (BBRI) devoted an article to this development in the June 1964 issue of its journal, in which it featured the great variety in precast concrete panels for façade cladding. The most common panels were no more than 0.1 m² in surface or 1 m wide, and 5 cm thick. These dimensions were related to the weight (approximately 50 kg) that two workers could lift. The panels were often composed of two consecutive layers of concrete, forming base and exterior finish layers, which were cast relatively quickly after each other to ensure a firm bond between the two. The finish layer incorporated special, and more expensive, ingredients, while the base layer was executed in normal concrete. To attach the panels to a structure, several types of (metal) anchors, wall ties, or clips were used, similar to those that were used to anchor natural stone panels. It was advised against fixing anchors to the concrete panels beforehand, as they would be vulnerable to breaking during transport. For brick walls, a popular means of attachment was a metal anchor that was fixed to the wall with copper wire and then slid into grooves in the concrete panels. For in situ concrete walls, special rails for the anchors could be cast in the wall. It was recommended that a cavity of approximately 2 cm be created between the loadbearing structure and the panels. A sufficient number of anchors had to be provided to ensure the panels were in the same plane for the entire wall. Another option was to use panels with reinforced ridges that were incorporated in the loadbearing structure as it was erected, which created a solid connection. As for the joints between the panels, usually the horizontal joints were filled with mortar and/or mastic. For the vertical joints, especially for the larger panels, several other options were available. If the panels had a groove or gap on the sides, these could be filled with fine mortar. Alternatively, the joints could also be ‘open’ with an elastic sealant or water repellent in the back of the joint. Commonly used sealants included synthetic rubbers like Thiokol (based on dichloroethane and sodium polysulfide), Neoprene (polymerized chloroprene), and Butyl (a copolymer of isobutylene with isoprene). A third, but little used, type was metal connection elements, e.g. metal brackets, or expanded sealing profiles with cover strips and fixing clamps, often in combination with an elastic sealant. In practice most designers opted for washed concrete panels or simple flat panels, in grey or beige colours. A technique for making panels with exposed aggregates (e.g. flint or rolled gravel) was to fill the moulds with a layer of sand before pouring the concrete: by brushing the surface after it was de-moulded, the aggregates became visible. Compared to the washed panels with visible aggregates, flat panels were more vulnerable to water infiltration, pollution, and mechanical damage, among other things. A way to overcome such vulnerabilities was to use a very compact type of concrete, like the one developed by the Dutch company Schokbeton. Invented in the Netherlands in 1931, Schokbeton was a new type of precast concrete: formwork was fixed to a special vibration table and ‘shocked’ intensively while being filled with concrete. This setup ensured a rapid and effective compaction and yielded exceptionally durable, stiff, and slender (and therefore economical) elements. The production process guaranteed a flawless surface. If desired, the elements could receive an extra surface treatment in the factory, e.g. sandblasting or acid-scouring. Because of the need for heavy machinery, this technique was out of reach for many small contactors. Nevertheless, they could order elements from the Dutch Schokbeton factory in Zwijndrecht. In the post-war period, Schokbeton (or ‘Shockcrete’) was used in many European countries (including Belgium, France, Germany, Switzerland, Austria, Spain, Italy, and Finland), as well as in Africa, Asia, and America. In Belgium, Schokbeton was used from the early 1950s onwards: the guaranteed durability and high quality finish, together with a reasonable price, convinced many architects to use it for cladding panels as well as for window frames, stairs, parapets, etc. 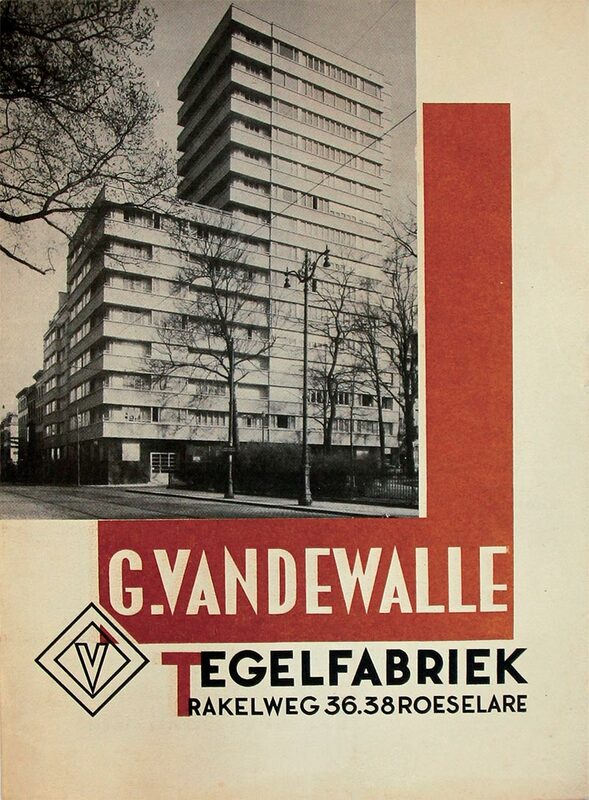 It was used in some of the large social housing projects of the 1950s in Belgium, e.g. in Antwerp (Jan de Voslei, Jos Smolderen and Rik Maes, 1950-1965; Luchtbal, Hugo Van Kuyck, 1954-1956 and 1960-1962) and Liège (Angleur, 1954-1979 and Plaine de Droixhe, 1954-1979; both by Groupe EGAU). The high-rise building block in Ganshoren, commissioned by the housing company Les villas de Ganshoren, also used Schokbeton for large precast frames that enclose the windows (architects Gaston Brunfaut and Albert Van den Bossche, 1959). By then, the ground was set for what became a trend from relative small and simple cladding panels, to storey-high precast elements that defined the architectural composition of the façade. Architectural precast concrete, popular from the 1960s onwards, combined the structural, functional, aesthetic and financial advantages of concrete in one element. It could be designed in the most diverse ways: both flat panels and curved forms were possible, while surfaces could be textured (e.g. in relief or imprinted, polished, and sandblasted). Especially in office buildings, the formal and three-dimensional possibilities of architectural precast concrete were exploited. Examples include the bank offices for BBL (now ING, Gordon Bunshaft, 1959-1965) and ASLK (now BNP Paribas, Marcel Lambrichs, 1973-1974) in Brussels, and the headquarters for CBR in Watermaal-Bosvoorde (Constantin Brodzki, 1967-1970). In housing projects, on the other hand, where the need for prestige was less and budgets often much smaller, it was used less frequent and designers chose architectural precast concrete less for its formal possibilities than for aesthetic surface finishes. The most common types of architectural precast concrete elements in housing were frames, solid panels, and parapets. The precast elements often had standardized dimensions: a module of 30 cm was mainly used for widths; for heights, usually the elements were dimensioned from floor to floor. If the concrete façade elements were designed like windows frames, the glazing could be incorporated during manufacture. The joints and connections were constructed in many different ways. For example, the elements could be fixed by means of protruding reinforcement bars, after which the joint was filled with in situ concrete. Or the protruding bars were connected to the reinforcement of the skeleton structure, cast in situ, so that the façade element acted as a permanent mould. Non-loadbearing façade elements were also hung on adjustable, stainless steel anchors. The joints could be ‘open’ (with a sealant in the back of the joint) or ‘closed’ (with mortar or a sealant close to the surface). The UACB recommended Thiokol for watertight joints in a 1973 technical handbook on architectural precast concrete. The joints were typically between 6 and 18 mm wide. From the end of the 1960s onwards, precast concrete became popular for large, storey-high, loadbearing façade panels, which were used in high-rise buildings and in low-rise housing. The panels, complete with pre-cut door and window openings and sometimes also integrated ducts and pipes, were increasingly composed of different layers: not just an extra finishing layer on the outside, but also an inner cavity, sometimes filled with an insulation material. Especially after the oil crisis, the latter option was selected more frequently. A reason for the rise of precast concrete panels was the support of the government: the Ministry of Housing and the public service housing societies encouraged the use of precast concrete to reduce construction time and for financial benefits. From 1965-1970, several small-scale building projects of some 20 to 40 houses were constructed with precast concrete. In 1965 a housing complex was constructed in Orcq, comprised of 20 houses with loadbearing precast concrete walls with inlaid brickwork. The panels were fabricated by the French company Camus-Nord, which had developed a special production line for low-rise housing. Later several Belgian companies with experience in precast concrete panels entered the field to prefabricate elements for small-scale social housing complexes, for example the partnership Industrialisation Belge du Bâtiment (complexes in Gembloux, Waterloo, and Clabecq), Van de Kerckhove’s Prefa (complexes in Sint-Lievens-Houtem and Zelzate), and Delmulle (complexes in Torhout and Lamain). The results were more or less similar: costs were 10 to 15% less than, and construction times half or only one third of, what they would have been for traditional construction. In most cases, the panels included bricks inlaid on the exterior side. This was created by arranging bricks at the bottom of the precasting moulds, which were held in place by the layer of concrete that covered them. More labour-intensive and costly than plain concrete panels, this precast brickwork allowed a novel construction technology to present a traditional appearance. 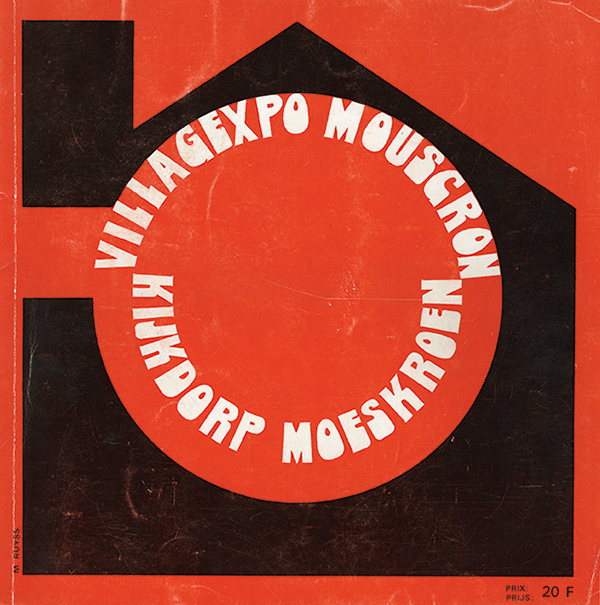 Various types of precast sandwich panels were shown in the model home expositions held in Moeskroen, Limal, and Heist from 1970-1973. These ‘living labs avant-la-lettre’ were erected under the supervision of housing societies and research institutes, such as the BBRI. Much importance was attached to the technical quality of the building systems. The bids were studied in detail beforehand, and several inspections and measurements were made during and after the construction process. The model home expositions proved to be a perfect means to evaluate the variety of precast concrete sandwich panels available in the market at that time. At the Moescroen exposition, which was actually organized by the Union of Contractors-System Builders instead of a housing society, nine contracting companies built 20 houses in total. Fourteen of these were constructed with loadbearing cavity walls in precast concrete. These cavity walls had an inner leaf in concrete (in Argex concrete or regular concrete, sometimes finished with plaster), while the outer walls were either a half brick wall or in concrete (regular concrete or micro concrete, and finished with a brick inlay, plaster rendering, visible white stone aggregates, or the imprint of the textured mould). Between the inner and outer leaf was a ventilated or insulated cavity. The model home exposition in Limal was larger (178 houses built by 18 firms, using 63 different types or systems), yet again more than half of the houses were constructed with loadbearing precast concrete walls. There were single walls (in lightweight Ytong or Argex concrete, sometimes completed with a layer of polystyrene insulation and gypsum board), yet most of the contractors used cavity walls. In the case of cavity walls, the materials were more or less the same as in the houses in Moeskroen: regular concrete or Argex concrete was used for the inner leaf; the core consisted of polystyrene or other insulation materials; the outer leaf was in either masonry or concrete with brick inlay, washed flint, or other exposed aggregates. Likewise in Heist, which featured 106 houses built by eight companies, cavity walls of loadbearing precast concrete with an inner core of insulation were the dominant type. In addition to the building companies that took part in the model home expositions (e.g. Delmulle, Elbeko, Declerck en Zonen, Rhodius-Deville, R. Maes, Roosen, Caroni-Lecomte, Van Den Bogerd-Elst, Van De Kerckhove’s Prefa, Usidour, and Koramic), many other Belgian companies produced façade panels in architectural concrete (not necessarily with a complete house behind it) during the 1960s and 1970s. In 1975, the catalogue of the UACB listed 31 manufacturers of façade frames, parapets, and flat panels in architectural concrete. Some of the more significant market players were Antwerpse Machinesteenbakkerijen, CBR-Ergon, Eurobeton, Marbra-Lys, Seghers Prefalith Beton, and Kunststeenfabriek Vandewalle. Most of these manufacturers specialized in diversity, meaning that they all tried to offer the broadest possible range of products, instead of focusing on one particular style or element. 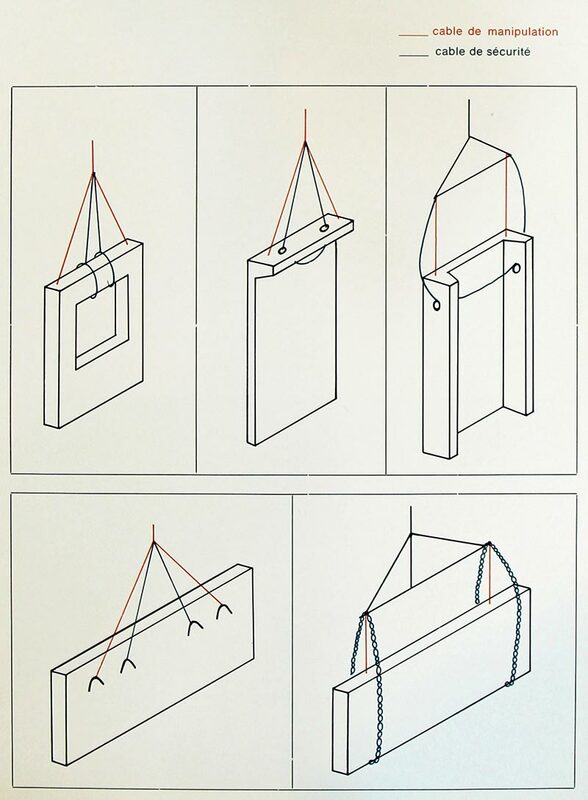 The 1975 catalogue shows that most companies produced different types of panels, both loadbearing and non-loadbearing, which came as single wall elements or sandwich elements, with or without insulation in between layers. The four main surface options were smooth, washed, acid-scoured, and sandblasted concrete. Manufacturers also offered façade elements with various connections and details, and made of concrete with varying chemical compositions. Fillers and additives like plasticizers, bond accelerators or retarders, air entraining agents, coloured pigments, glass fibres, etc. allowed manufacturers to manipulate the strength; thermal and acoustical isolation; weight; colour; texture; and even the transparency of the material. By (small) variations in the materials, forms, proportions, and techniques, innumerable types of concrete panels were produced. A seemingly infinite number of choices was something that the industry explicitly featured in its advertising. The company Antwerpse Machinesteenbakkerijen holds a special position in this list because it specialized in brick manufacture rather than concrete. Nevertheless, the company produced a composite panel Pandal combining bricks and concrete. The panel consisted of a pre-stressed concrete outer layer and an inner core of masonry blocks. It resisted compression forces up to 34.32 N/mm², and the hollow core gave it good insulating properties compared to regular concrete panels (1.63 W/m²K). The exterior surfaces could be white concrete with a smooth surface or textured with exposed flint. The panels were typically 4, 5, or 6 m wide (maximally 10 m) by 60 cm high and 12 cm thick, and weighed 165 kg/m². An unusual feature of this panel was that it could be demounted and reused: they were usually installed by stacking one on top of the other (with a tongue and groove fitting) and attaching them to a steel, concrete, or timber skeleton with reversible, galvanized steel hooks. Another installation option was to slide them into profiled columns and fill the joints with mortar; in this case, they could not be demounted. CBR-Ergon, a daughter company of the cement manufacturer CBR, was established in 1963 to produce precast concrete elements. CBR-Ergon mainly focused on standardized structural products such as beams, columns, and hollow core slabs, yet almost immediately after its establishment, the company also set up a research and production line for façade elements in decorative and architectural concrete. Research connected with these elements focused on the composition of the mixture, compaction of the wet concrete, formwork, texture and finish of the elements. With some remarkable offices in architectural concrete designed in collaboration with architect Constantin Brodzki, Ergon became one of the major players in this field. The most striking realisations by CBR-Ergon were in office buildings rather than residential buildings. Established in 1964 in Massenhoven, Eurobeton became an important manufacturer of architectural precast concrete. The firm’s range mainly consisted of façade frames, parapets, and flat panels for offices, public buildings, etc. Eurobeton used both timber and metal formworks fixed to vibration tables, and portable formworks in plastic and metal, for fabricating their products. Marbra-Lys, established in Kortrijk in 1913, was originally a supplier of building materials. During the 1950s, the company moved to Harelbeke, and their emphasis shifted to the industrial production of tiles, claustra, and stairs in marble mosaic, artificial stone, and artificial marble Marbralyth. From the 1960s onwards, the company added façade elements in architectural concrete to its product line, especially for applications in office and apartment buildings. Architectural concrete was precast in a 150 m-long production hall, which included equipment for vibrating and steaming the concrete. At the end of the 1990s, the company Decomo in Moeskroen took over Marbra-Lys’ department for architectural concrete. Seghers Prefalith Beton in Aalter started with the production of architectural concrete in 1956. The acquisition of new production sites in 1967-1968 in Aalter coincided with a considerable expansion, including extensive new facilities to produce architectural concrete and fibre reinforced concrete, using the latest scientific and industrial equipment. It became one of the major producers of architectural concrete in Belgium, and also exported to the Netherlands and France. The production process for architectural concrete was organized according to a 24 hour cycle. The formwork was filled at a fully automated mixing plant. 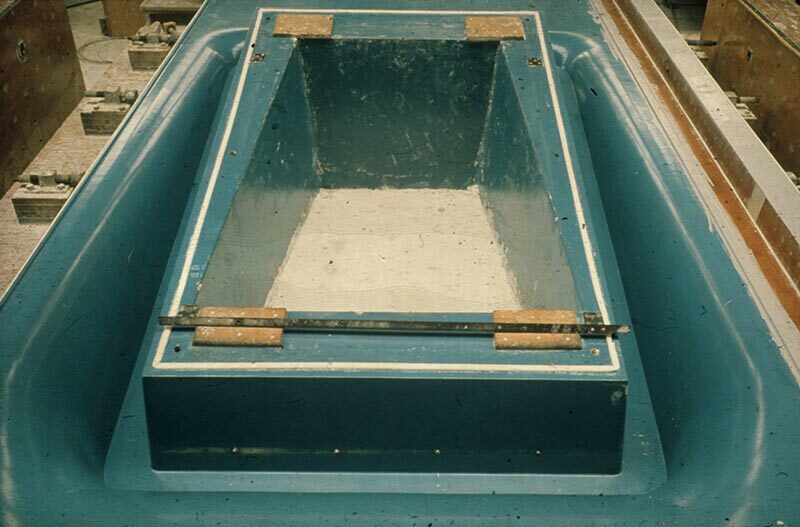 After the elements were compacted on heavy vibration tables, they were transported into a climate tunnel for curing. At the end of the tunnel, the elements were demoulded and underwent a surface treatment. The company published their own building specifications, with specific recommendations for architectural precast concrete. These included specifications related to insulation, joints, connections, anchors, surface treatment, and execution of a prototype. A typical façade panel in architectural precast concrete consisted of two layers: first a decorative layer, at least 10 mm (with rolled or crushed quartz or porphyry), was cast, followed by a layer of regular concrete. The panels were 7 cm thick and up to 2.50 m long; for larger panels, stiffening ribs or ridges were provided. Seghers Prefalith Beton also manufactured sandwich panels consisting of a 5 cm panel of decorative concrete, 2 or 3 cm of polystyrene, and 5 cm of lightweight concrete. These (insulating) panels were used to construct office, residential, and public buildings such as schools and municipal administrative centres. In 1985, the company was taken over by Loveld in Aalter. The artificial stone company Kunststeenfabriek Vandewalle was established in 1960 in Roeselare by the same family that had already founded a tile factory in 1920. Vandewalle’s products developed from relatively small, decorative elements in artificial stone, to load-bearing, high-quality, and fully finished elements reaching from floor to floor. One of their products was Quartzolite, a particular type of concrete based on natural quartz stone that was watertight and frost-proof. Quartzolite was used to make façade claddings (usually 4 cm thick), thresholds, door frames, capstones, among other things. Although the market for architectural precast concrete and precast concrete cladding blossomed during the second half of the 1960s, there was a lack of scientific knowledge and official regulations regarding the design, manufacture, calculation and installation of these elements. At the end of the 1960s, the professional association UACB published a brochure – years in advance of an official norm or regulation, which would not appear until 1980 – with technical recommendations on the fabrication of decorative concrete. 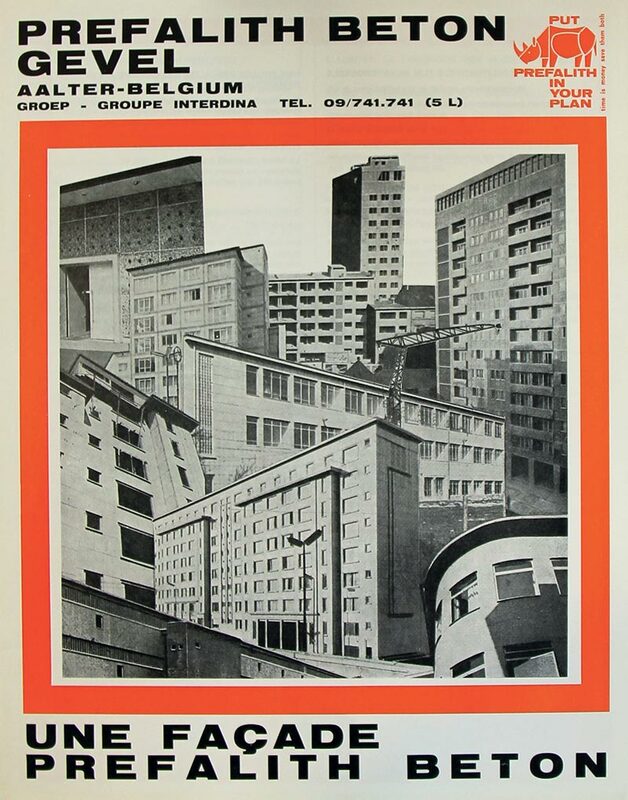 In this brochure, which was edited with the help of several companies (Agref, Blocbeton, Bétons de Callenelle, Balency, Cimarmé, CBR, Dauchot, Dura, Fixolite, Industrialisation Belge du Bâtiment, Jo, Marbra-Lys, Prefalith, Torfs, and Van Thuyne), the UACB suggested a minimum thickness of the exterior decorative layer of concrete of 10 mm and a minimum concrete cover over the reinforcement of 15 to 20 mm. Other recommendations were related to a minimum compression resistance (34.32 N/mm²) and the minimum width of joints (10 mm). During the 1970s, the General Specifications for the execution of private buildings (co-edited by the BBRI, the Royal Federation of Architects’ Associations in Belgium FAB and the National Confederation of the Building Industry NCB) added information on precast façade elements. In the 1970 edition, no reference was made to these elements in the chapter on concrete constructions. The chapter on masonry and façade cladding did contain a paragraph on precast elements in decorative concrete for façade cladding, which referred to small elements with special compositions or surface finishes, and also precast concrete covered with a decorative material. The recommendations for the thickness of the top layer of decorative concrete, the reinforcement cover, and for compression resistance, were the same as those in the UACB brochure. Furthermore, the General Specifications called for metal accessories (like anchors, etc.) to be executed in galvanized steel, stainless steel, wrought iron, copper, or aluminum. Regular joints should be 8 mm wide ideally, and also 10 mm wide supple joints were recommended, every three floors (horizontal joints) and every 20 m (vertical joints). These supple joints could be executed in a bituminous packing, an expanded sealing product, a cover strip in stainless steel or plastic, or a custom adhesive. In the 1978 edition, a new section of nine pages was added to the chapter on concrete constructions that dealt with precast elements in architectural concrete, and covered large elements with a decorative function, both loadbearing and non-loadbearing. It contained prescriptions related to the form, measurements, appearance, constructive aspects, joints, transport, mounting, etc. In general, the prescriptions were more stringent than those for the small, non-loadbearing elements treated in the previous edition, requiring a minimum thickness of 20 mm for the decorative top layer and 20 to 35 mm for the concrete cover. The 1978 specifications also introduced the MUREG-code, each letter representing a particular parameter (M = dimensional tolerance, U = appearance, R = characteristic compressive strength, E = water absorption, G = frost resistance). With these five capital letters and qualifying subscripts a, b or c for each capital, codes were generated allowing each element in precast concrete to be characterized by these five important parameters. 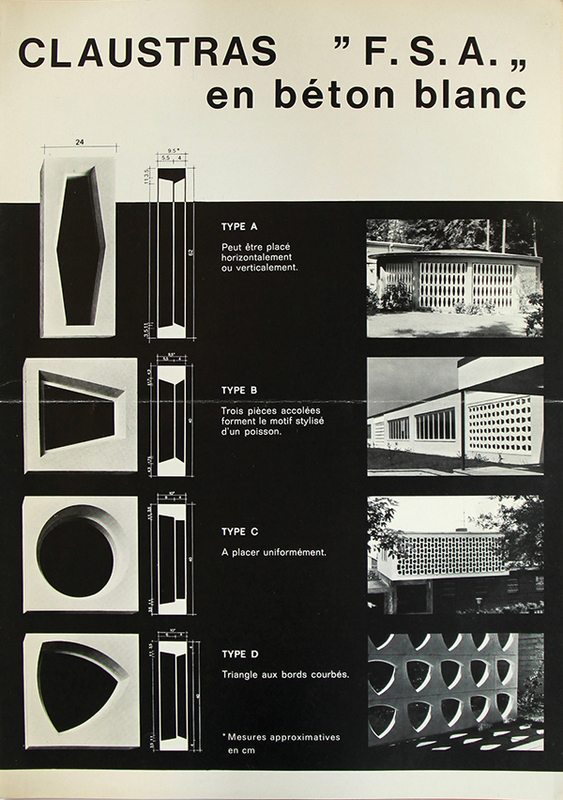 In the meantime, in 1975 the UACB also published new technical recommendations for the design, fabrication and installation of architectural precast concrete. According to these recommendations, the compressive strength for façade elements had to be over 11.77 N/mm² (14.71 N/mm² for smooth concrete). Reinforcement bars had to be 16 mm diameter or less to avoid cracks, while the minimum concrete cover was set at 2 or 3 cm. Cracks needed to be taken into account during the design process as they were an important issue in façades exposed to wind and rain. Cracks could be caused, for example, by unequal deformation of the prefabricated façade elements and the beams on which they rested, or by (a difference in) thermal dilatation. As for concrete compositions, this topic was studied by the UACB in cooperation with the BBRI: from 1972-1976 they investigated the durability of existing structures in architectural precast concrete. An article reporting on this research mentions six popular compositions. These included various types of aggregates (e.g. Taunus quartz, gravel from the Meuse, flint aggregates, and Eifel quartz) and sand from the area around Mol or from the Rhine. The cement used usually was grey Portland cement (P400), but sometimes grey blast furnace cement (HK400) or white cement were used. Precast concrete façade panels were used mainly in apartment buildings, less so in individual houses. 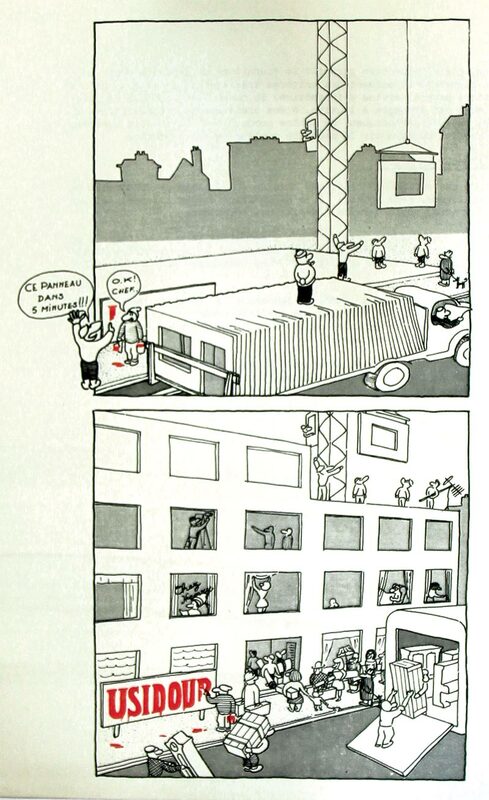 This can also be seen in architectural publications from the period 1945 to 1975. Among the approximately 160 cases of houses for which the materials used were described, about 20 of them continued precast concrete façade elements. 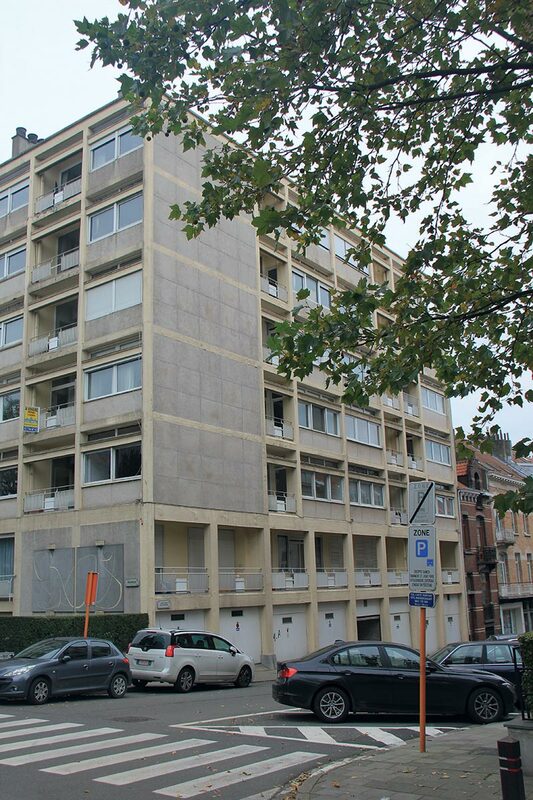 Except for one freestanding villa in Uccle (clad with painted, smooth concrete panels) and private houses with claustra, almost all of them were medium-rise or high-rise apartment buildings (mostly with 4 to 15 floors). In these apartment buildings, for both public and private owners, precast concrete was used primarily for cladding, followed by a few applications in balconies. Most of the apartment buildings had a skeleton structure in reinforced concrete. The skeleton was either left visible and articulated, with precast panels between the members, or the skeleton and the (lightweight concrete) walls between were covered with precast panels. The precast concrete panels incorporated various aggregates, e.g. quartz, flint, rolled gravel, white stone, porphyry, etc. The surface was washed, polished, or smooth (without any treatment after being demoulded). As for the aesthetics, precast concrete panels allowed architects to play with the color and the line patterns. The panels sometimes adopted the color palette of the plinth and windowsills, or the panels could contrast with the color of the visible concrete skeleton. The line pattern of the joints was also clearly incorporated in the design of the façade – expressing a rectangular, modular grid, or emphasizing the horizontal lines of the balconies. Very few details about dimensions, connections, mounting techniques etc. were given. In one case, a writer noted that the panels were placed after the skeleton was finished; in another, that the panels served as permanent formwork for the skeleton; and in a third case, that precast panels covered the sides of the balconies, which were mounted dry with open joints. 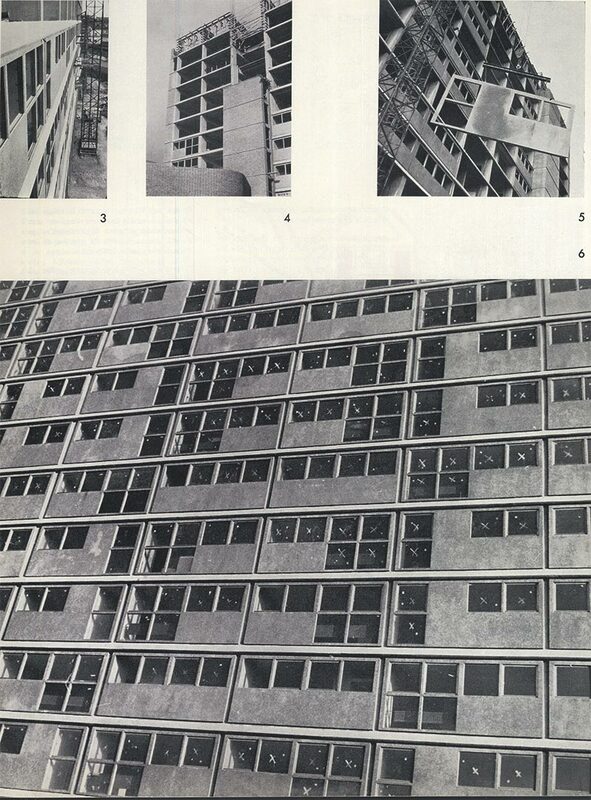 One very particular solution was used by architect Charles Van Nueten in the social housing complex in the Rue Haute in Brussels: the façades, which were separated from the concrete skeleton, consisted of precast panels and precast posts, which had slits for inserting the panels. These posts created a square grid on the otherwise flat façade, while enabling a free expansion of the panels and minimizing the risk of cracks. In only a few cases did writers provide names of the manufacturing firms, i.e. Siegwart S.A. Belge des poutres et planchers, Kunststeenfabriek Vandewalle (in connection with Quartzolithe), and Seghers Prefalith Beton. 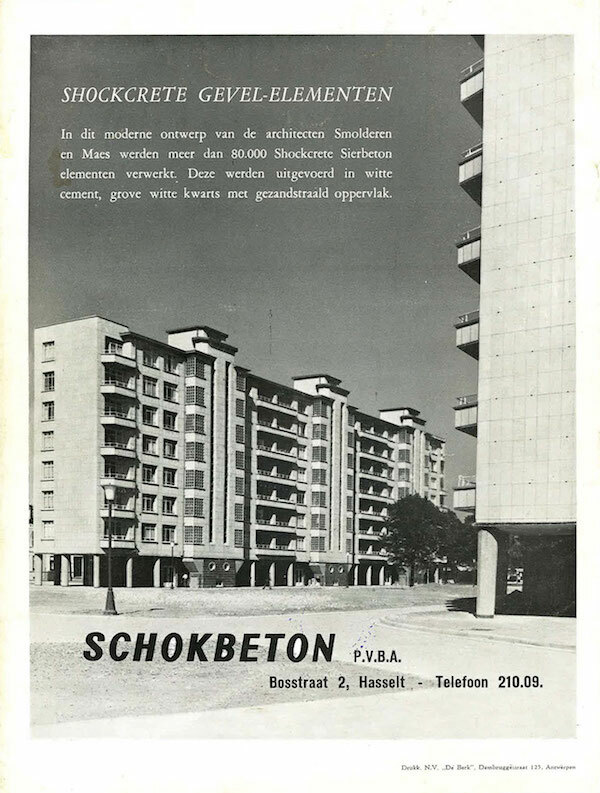 Schokbeton was also mentioned, for instance for floor tiles on balconies and large window frames. As far as can be concluded from the brief descriptions, most applications of precast concrete façade panels were for non-loadbearing cladding, often leaving an air cavity between the panels and the structure. The use of sandwich panels seems to have been rather exceptional. An interesting case is the high-rise apartment building Ieder Zijn Huis in Evere by Willy Van Der Meeren: the closed parts of the large, storey-high, precast façade elements were composed of two layers of concrete of 5 cm each (pumecrete with a smooth finish on the inside and rich concrete with a washed surface on the outside), and a 2 or 3 cm layer of expanded polystyrene insulation in between. Also Gaston Brunfaut used prefabricated sandwich panels in three social housing blocks in Laeken commissioned by Le Foyer Laekenois. These panels consisted of vitrified bricks on the outside, a core of insulation, and a layer of concrete on the inside. Go to the image archive or Read "heavy prefab systems"